A 20-year-old passenger who tried to run away from the crash site was mowed down by a hit-and-run driver. Two people have been arrested after trying to flee Sunday from the scene of a car crash on a South Bay highway where a man, who was also attempting to run away, was mowed down by another car. 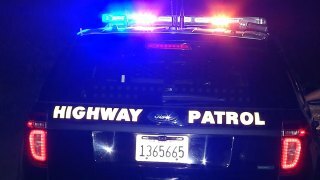 The incident began at around 3:50 a.m., when California Highway Patrol officials received a report of an overturned SUV on the northbound Interstate Highway 280 connector ramp to southbound state Highway 87, according to CHP officials. The green 1997 Honda Passport somehow landed on its roof and was blocking the right shoulder lane. The seven passengers inside, including the driver, all fled the scene of the accident on foot, CHP officials said. CHP officers arrived and detained four of the passengers near the bottom of the ramp. Assisting police officers then detained the driver, identified as Izabell Fernandez, and another passenger on a street nearby. On Monday, the CHP said that Fernandez, 19, of Santa Clara, suffered minor injuries and was charged with driving under the influence and felony hit-and-run involving death or injury. Passenger Patrick Segovia, 27, of San Jose, was uninjured and charged with public intoxication, officials said. Both have been booked into the Santa Clara County Main Jail, according to the CHP. The remaining four SUV passengers — all San Jose residents ranging from 20 to 26 years old — were transported to Valley Medical Center and Regional Medical Center with minor injuries, CHP officials said. A 20-year-old passenger also allegedly walked into the northbound lanes of state Highway 87 and was fatally struck by another car. The victim, a San Jose resident, was pronounced dead at the scene. The vehicle that struck the victim fled the scene and has not been identified, according to CHP officials. Anyone who may have witnessed the initial accident or the subsequent fatal hit-and-run crash is asked to contact the San Jose Area CHP office at (408) 467-5400.